Before APEX 5, APEX workspace administrators and developers had to remember local passwords for each APEX workspace. This could result in several passwords to remember and become a real problem. 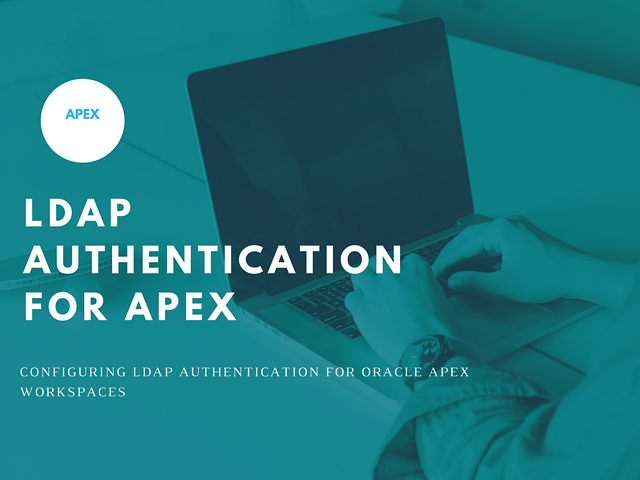 APEX 5 made it possible to use LDAP authentication for APEX workspaces thereby reducing the number of passwords needed. The administrator or developer only needs to remember his or her LDAP password. 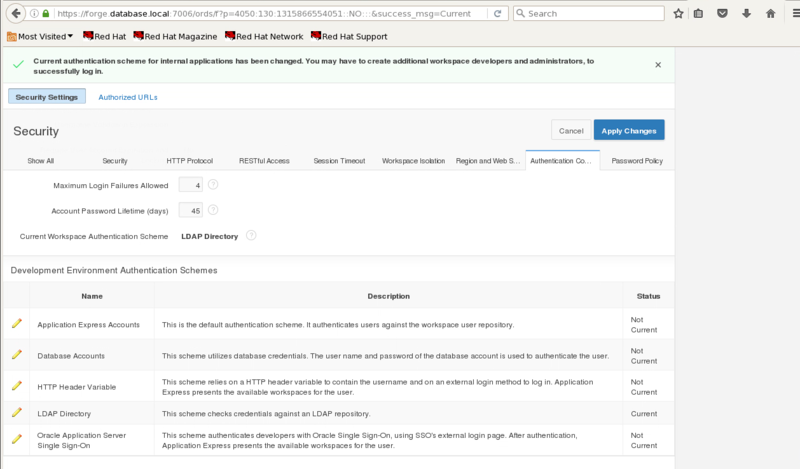 This article details configuring APEX for LDAP workspace authentication. Log in to SQLPLUS or another SQL client as the sys. 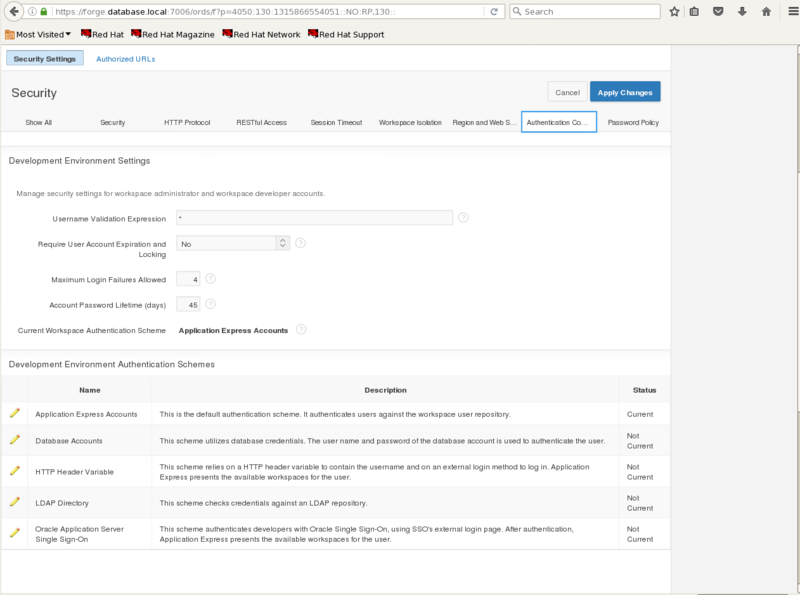 You should now be able to log in as the APEX Instance Administrator as before changing the authentication scheme. Note2: You must also select an LDAP user who will have APEX administrative privileges for the instance. For example, you may have admin as the APEX administrative user. 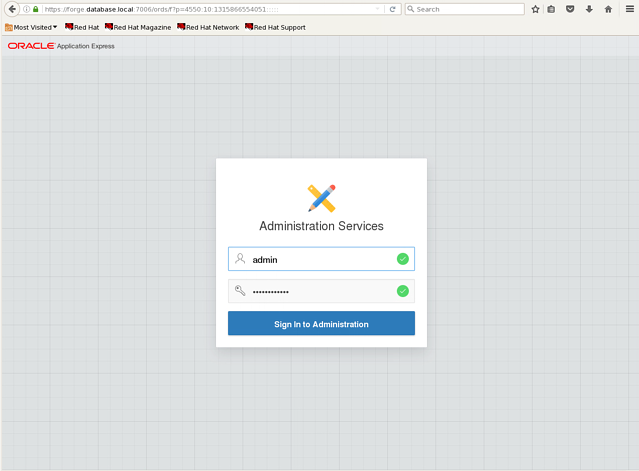 But there may not be an admin user in your LDAP installation – at least not one that you want to use as an APEX administrator. Therefore, you must select and configure one or more LDAP users to serve as the APEX administrator(s). Log into the APEX administration page. This can be done from either. with “internal” as the workspace. 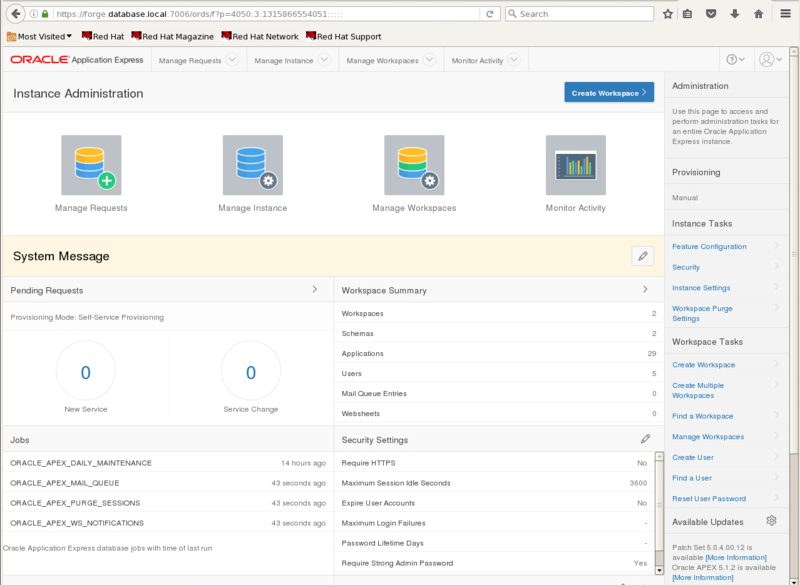 The Instance Administration page displays. Select the Authentication Control tab. 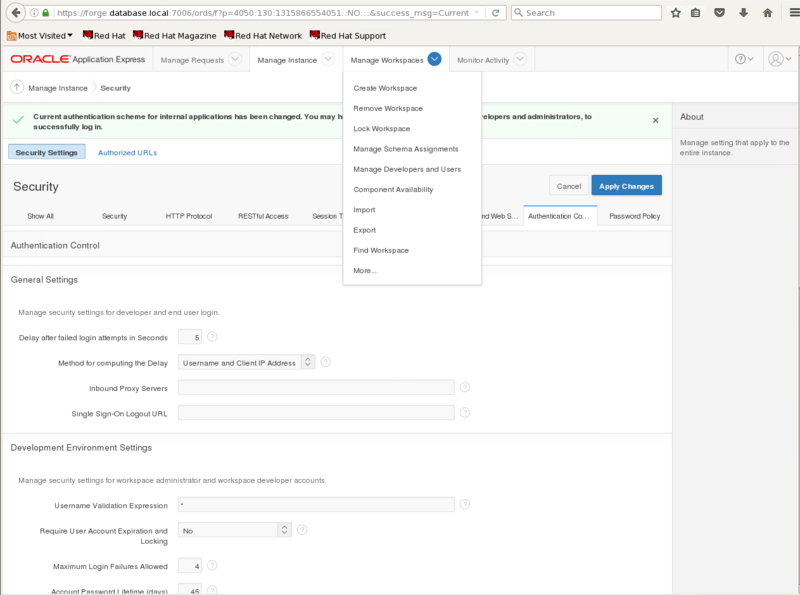 Go to the “Development Environment Authentication Schemes” section. Select the edit icon next to the LDAP Directory option. The Edit Authentication Scheme screen displays. Port: The default port for Non-SSL is 389. Enter the correct port here if you are using SSL or another port. if there is an issue with changing the authentication scheme. This was discussed above. 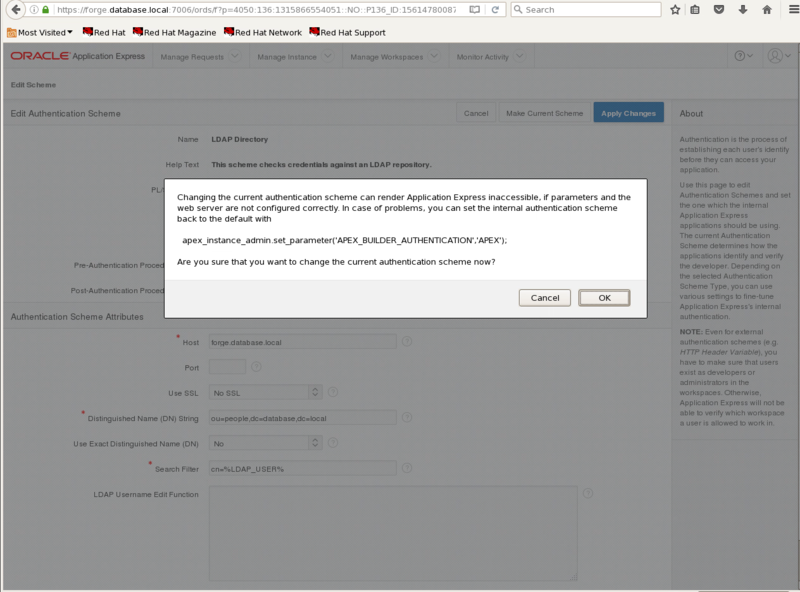 The screen indicates that the LDAP scheme is now the current authentication scheme. 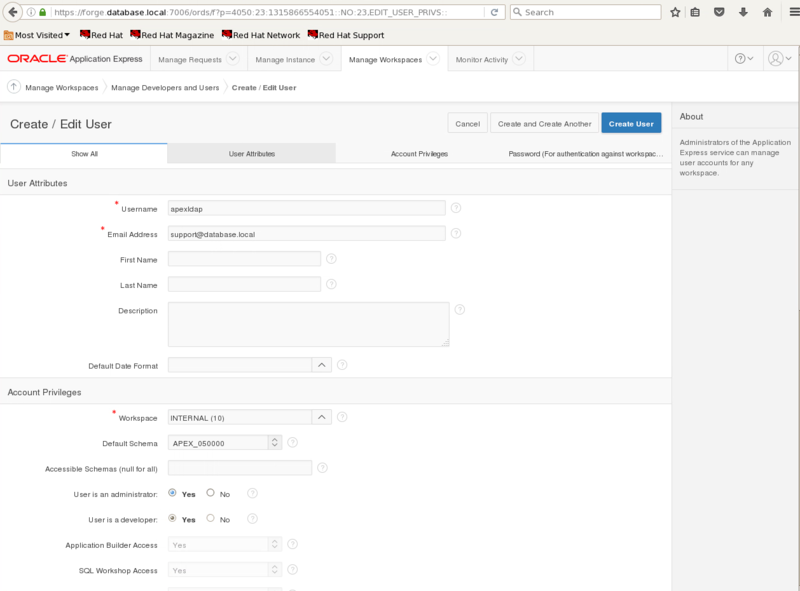 Create a user to serve as the instance administrator. This user must correspond to an LDAP user. 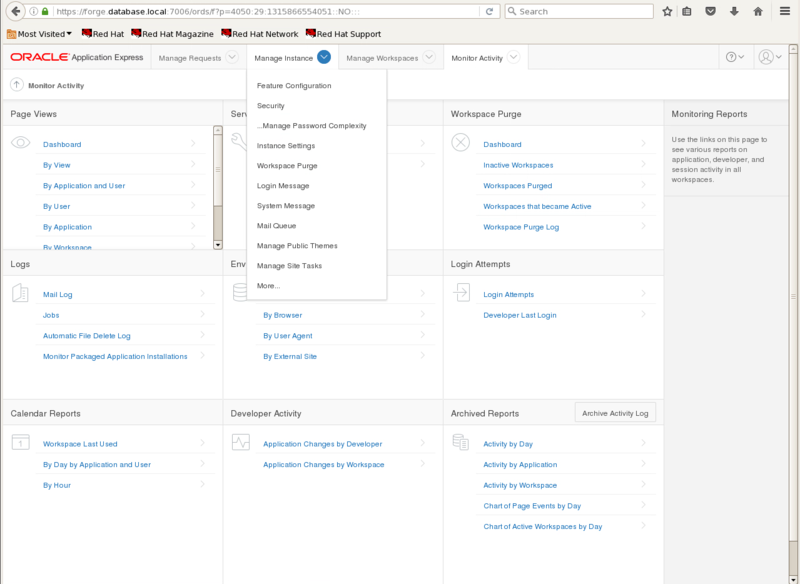 Select Manage Workspaces --> Manage Developers and Users. The Manage Application Developers and Users screen displays. The following assumes that there is an LDAP user called “apexldap”. Passwords are not needed since the LDAP password will be used to log in. 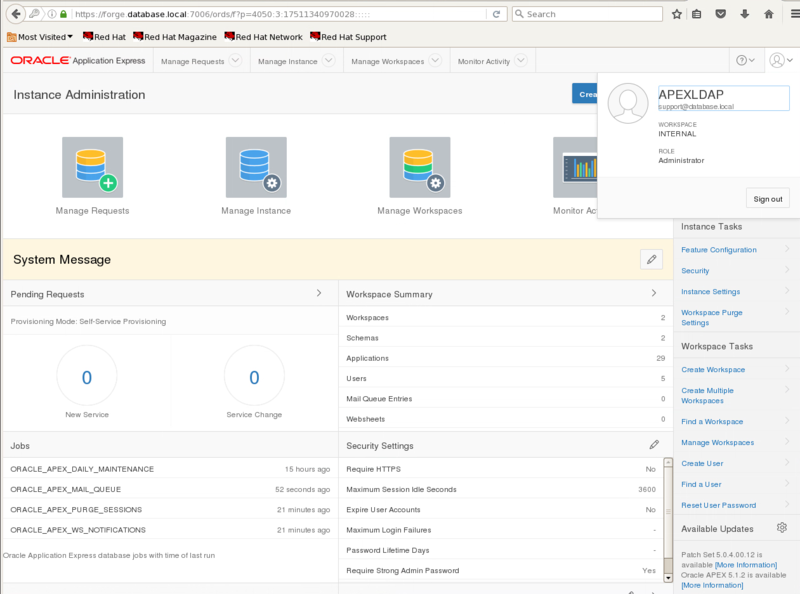 The screen indicates that the new APEX Instance Administrator has been created. Create any other needed APEX users. The new and any existing users should correspond to LDAP users. APEX is now configured to use the LDAP directory. The users can log in with their password. 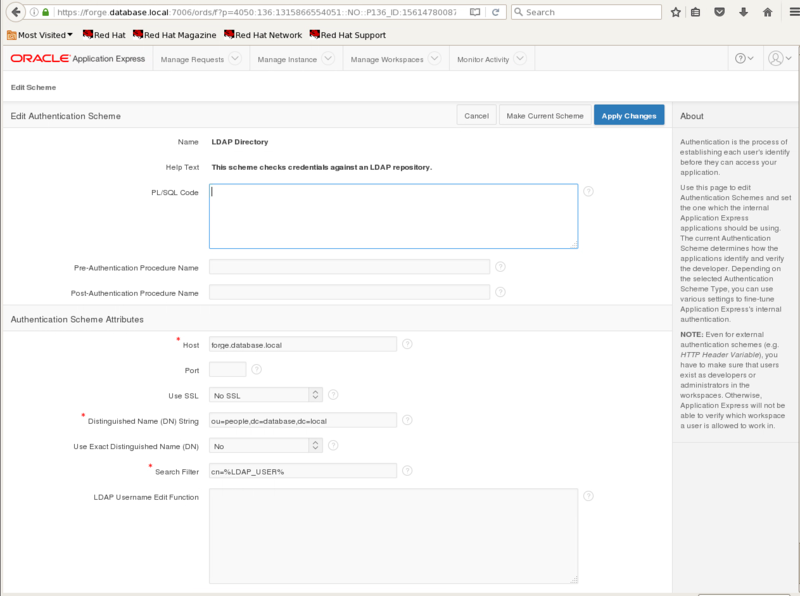 The APEX Instance Administrator created above now administer the instance. This screen shows that the new APEX Instance Administrator has successfully logged in using LDAP. Oracle APEX allows rapid development of database applications utilizing the Oracle database. 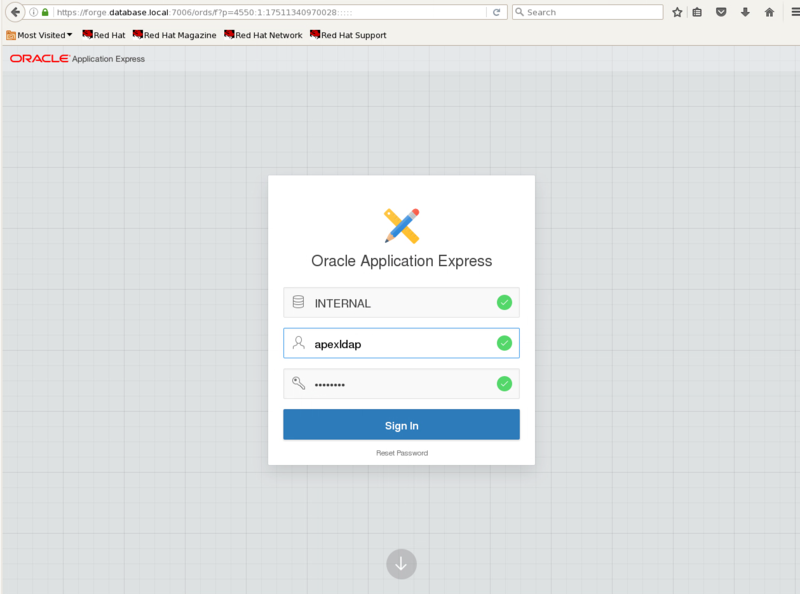 Oracle WebLogic may be used as the web server for Oracle APEX applications by utilizing Oracle REST Data Services (ORDS), formerly named the APEX Listener. 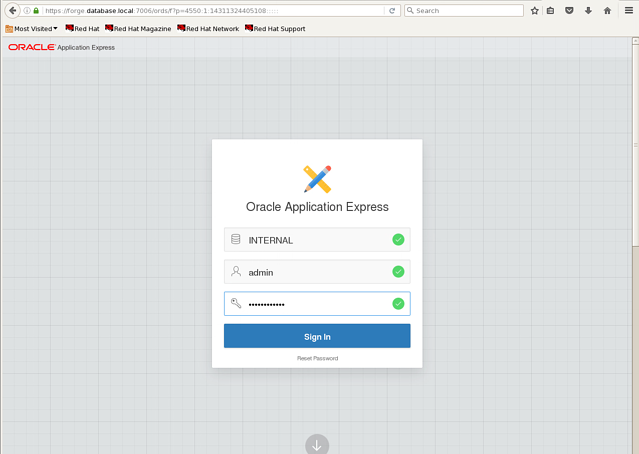 This white paper details the steps needed to set up an Oracle APEX environment using Oracle Rest Data Services (ORDS) on Oracle WebLogic. Copyright © 2008 AIMSTAR Information Solutions, Inc.. All Rights Reserved. DISCLAIMER: AIMSTAR Information Solutions, Inc. makes no warranties, expressed or implied with respect to the fitness of this document for a particular purpose. AIMSTAR Information Solutions, Inc. does not warrant, guarantee or make any representations regarding the use or the results described in this document in terms of its correctness, accuracy, reliability, currentness, or otherwise. The entire risk as to the quality and performance of the document is with you. Some states do not allow the exclusion of implied warranties, so the above exclusion may not apply to you. In no event shall AIMSTAR Information Solutions, Inc. be liable for any direct, indirect, incidental, punitive, or consequential damages of any kind arising out of the use or inability to use the document even if AIMSTAR Information Solutions, Inc. has been advised of the possibility of such damages. Some states do not allow the exclusion or limitation of incidental or consequential damages, so the above limitation or exclusion may not apply to you.